Kathleen �Kat� Pearson-Thomas was born circa 1965 in Long Beach California to parents who were steeped in religious music and by the time that she could stand up and walk she was inducted into the church choir. Her parents also had a perchance for party�s and a liking for blues and soul. The combination was a heady mix that Kat soon latched onto and from an early age she became the family DJ spinning Blues, R&B, Soul and Tamla Motown. 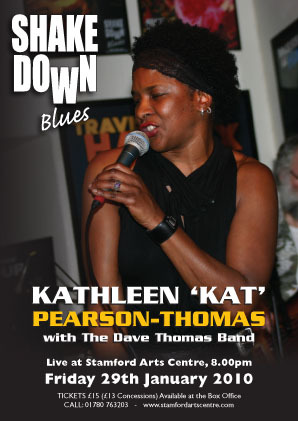 A few months later on February 28th 2009 Kathleen appeared at The Village Hall, Castor together with The Dave Thomas Band and a thoroughly enjoyable gig was had by all. Dave and Kat gelled almost immediately and as the evening progressed the band became tighter and Kat produced a 'Soul Blues show' that could only have been bettered if we had had more time for rehearsals. We decided then and there to bring her back and thankfully when Willie Littlefield had to cancel Kat and Dave were available to cover the Stamford Arts Centre slot. See Previous Events for the review of the Castor gig that appeared in Juke Blues.